Even after all these years, I'm still amazed at the amount of time we spend planning and organizing for the holidays when it seems to be over in a flash. Children open everything so quickly, even when you try to slow them down. Mine are now adults, so we take turns opening, but you just can't do that when they're younger. As it was, we barely got them through brunch, they were in such a rush to get back to playing. Food? No time for food. But then I've always loved the planning part....the organizing, the decorating, the cooking, finding surprises for everyone. No doubt there were times when my kids were really little that the mass confusion pre-Christmas wasn't quite so much fun, but I always remember enjoying the preparations. We had adults only chez moi this year; my Michigan kids decided to stay north as it's my granddaughter's first year in college and she wanted to be home to see her old high school friends. This was also, at 4 years old, my grandson's first year to understand what Christmas is all about. I was sorry to miss that. But they have their own traditions to make. My NY daughter was here, so this year we kicked back and took our time enjoying every minute. Not always easy....my Florida son works nights in the ER, so he comes right from work for our gift-opening and brunch, and he's exhausted. Then he goes home, sleeps and comes back around 6 for dinner. Not always the case. He's always here for Santa, but if he has to work that night, he misses Christmas dinner. Luckily, this year he got Christmas Day off. I am so grateful to all our emergency services people who are working holidays, while we enjoy ourselves. The ER, no matter the day or time, must deal with patients who are hurting, panicked and worried. I am in awe of people like my son David and so proud of him. Fortunately, this year, we were able to reward him with our traditional Christmas brunch, our love for him (and each other) always there in the background and then, later that evening, a lovely dinner....together. Now that the wrappings are all stowed away, we are perusing our new books, trying to figure out various electronics, admiring new clothes and polishing off leftovers, I often feel the need for quick and light dinners the week following Christmas. Company is still here and we do have to eat, after all. Faith from An Edible Mosaic came up with the perfect answer. It seems like a summer dish, but you can adapt the recipe no matter where you live. I increased the corn (use frozen corn if you need to) and use any veggies you want, but it was perfect just the way Faith made it. Thank you Faith! I've been making it on a regular basis! In a small bowl, toss together the zucchini, corn, spring onions, flour, 1/2 tsp salt, and 1/4 tsp pepper. Stir in the beaten eggs just until combined. Pour enough oil into a large skillet to generously coat the bottom. Heat the skillet over medium to medium-high heat, then drop the vegetable batter by the rounded tablespoonful into the hot oil and cook until golden brown on both sides, flipping once (about 5 minutes per side). Turn the heat down if the fritters start to brown too quickly. Once the fritters are cooked, transfer them to a paper towel-lined plate to drain any excess oil, then transfer them to a baking sheet and keep them in warm the oven until all the fritters are made. Repeat this process until all the batter is gone. In a small bowl, combine the sour cream, yogurt, seasoned salt, and 1 TB sliced spring onion greens. 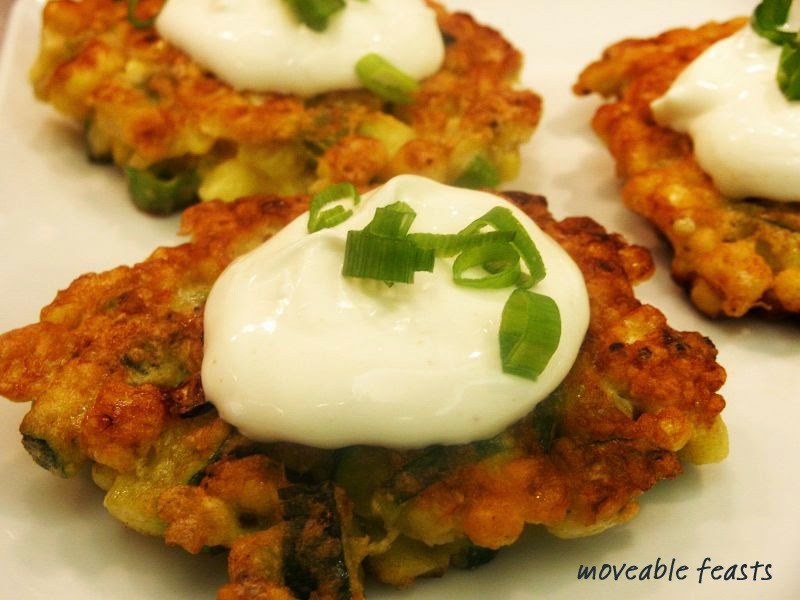 Serve the fritters garnished with the sour cream mixture and the remaining 1 TB of sliced spring onion greens. Serves 4 as a side dish or 2 as a main. Our Garden Club had their annual Christmas party last weekend. We each bring something and they buy a filet of beef at the market. Everyone prefers to bring appetizers and desserts (of course), so I thought I'd choose to bring a salad. I noticed someone else was doing tossed so I wanted to think up something different. My daughter Tracy said: why not serve burrata cheese and some heirloom tomatoes, simply tossed with a balsamic vinaigrette? A super idea and I had just had something similar at Michael's in Miami Beach during the Art Basel Miami show the first week of December. (The second biggest contemporary art show in the world; the biggest being the one in Basel, Switzerland in June.) Tracy had a booth in the show so I was back and forth quite a bit that week. AND she also had the salad at Michael's, hence the idea. Now, I'm sure you know all about burrata, but in case you don't: it's a fresh Italian cheese, made from mozzarella and cream. The outside is firm like mozzarella and the inside, which contains both mozzarella and cream, is very soft. It's served at room temperature. The name "burrata" means "buttered" in Italian and that is the literal truth: you cut into it and it's like butter inside! Michael's served it whole in the center of a plate with the heirloom tomatoes all around it. It made such a pretty presentation and then I thought I'd scatter some basil around to complete the Christmas colors. I'm trying to keep this nice and easy as we're all so busy this week. So no recipe here today, just make a simple vinaigrette with balsamic vinegar (I added a touch of fresh garlic), toss the tomatoes in it and sprinkle a little olive oil on the cheese. Easy as can be, lovely and light, and burrata is divine. Roast Beef Hash, Ornaments and a Christmas Meme! I've been making this rather unusual hash for years. Any time we have leftover steak or roast beef, my family loves this dish. Simple to put together, comforting and you can use that tender beef in a casserole instead of sandwiches, or when everyone gets tired of sandwiches. We love the red wine in it and while it bakes, it gets a little crunchy on top. Give it a good stir and all that lovely gravy in the bottom will coat everything. Haven't a clue where this recipe came from....could have been a friend or even in a magazine back in the 70's. If anyone knows, let me know. I wish I had been more thorough when I entered this kind of recipe in my MasterCook program years ago. Mix onion and garlic with herbs and saute in butter. Add potatoes and brown slighty. Add all other ingredients and pour into casserole. Bake 350 for 30 minutes. 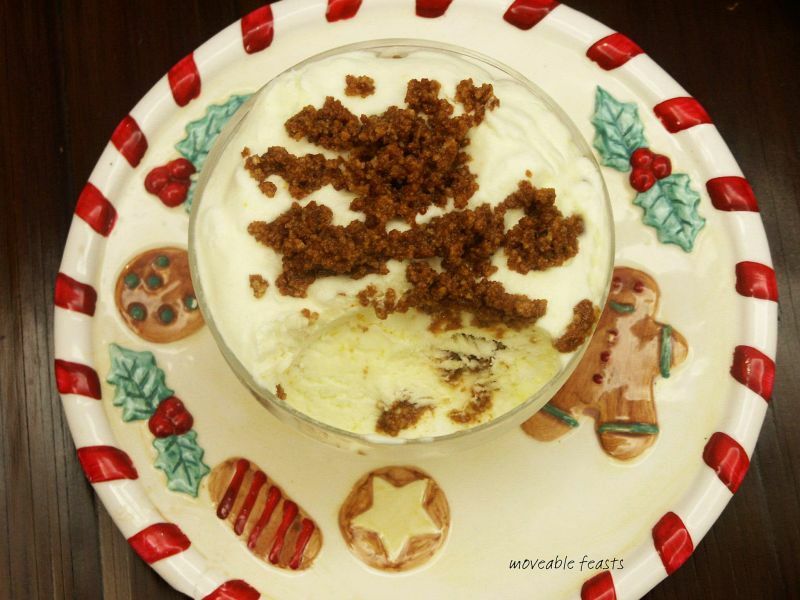 What are you having for dessert on Christmas Day? We're having an absolutely ambrosial Grand Marnier Mousse! An old family favorite, it's one of my Maida Heatter recipes, no ice cream churn required. You can make it ahead, freeze it and once frozen, cover tightly. It will keep in the freezer for a month and you can use it right out of the freezer with no last minute attention. It doesn't freeze hard and it's simple enough to make (although it sure uses a lot of bowls). It's a light mousse, sprinkled with a mixture of Grand Marnier and macaroon crumbs. In the last photo, you can see the texture. I like to serve it in mini souffle dishes or any pretty dish that is freezer-proof. This recipe makes 12 portions. Grind the macaroons in your processor. In a small bowl, mix the orange juice and Grand Marnier. Add the crumbs and mix thoroughly. Set aside. Beat the yolks with 1/2 cup of the sugar until pale and thick. Mix the grated rind and the Grand Marnier. Remove the yolk mixture from the beater and stir in the grated rind mixture. Set aside. In a chilled bowl with chilled beaters, whip the cream until it holds a shape but is not stiff. Set aside. Add the salt to the whites and beat until the whites hold a soft shape. Gradually add the remaining 3 tablespoons of sugar and the beat on high until they are stiff and dry. Fold together the egg mixture, the whipped cream and the egg whites. folding it all together handling lightly until mixtures are barely blended. Line up your 12 souffle dishes and spoon half the mixture into the cups. With your fingers, sprinkle about half the macaroon mixture. Top with the remaining mousse mixture (do not smooth the tops) and finish with the remaining macaroon mixture. Place in the freezer until they are cold enough to be covered. About an hour. Cover each with plastic wrap, careful not to smush the top. You can freeze overnight or up to 3-4 weeks. Serve directly from the freezer. My father was no slouch in the roast beef department either. Mother served it every Christmas Eve and one of his favorite restaurants, Dante's in Ft. Lauderdale (now defunct), served it as a special every Saturday night. You can imagine where the two of them (and sometimes the rest of us) had dinner every single Saturday, can't you? Now it's never been something I made regularly. But when I made it for Dad, I made that old never-fail recipe from the Make It Now, Bake It Later cookbooks, where it sat in an oven for hours after a bit of high heat. And now that both those lovely men are gone, I haven't made it once. I'm going to rectify that right now. Vegetarians, you may want to shut your eyes, say hello and pass on by my blog today. Because there's a big slab of rare BEEF coming up. This is yet another recipe I found in Fine Cooking magazine. A salt/herb encrusted roast. I'd never done it before. Sound complicated? It wasn't and the results were as tender as can be. My only suggestion: I wish I had browned it a little more before I put the salted dough on. So if you decide to try this, sear your roast nicely on all three sides. And once you take the crust off (yes, it actually comes off in one piece) wipe some of the salt off the roast. As for this divine sauce, I know morels are really expensive, so use any wild mushrooms you have available; it's a lovely accompaniment for the beef. I happened to have some dried morels in the pantry so I used them. I used to make a horseradish sauce with roast beef, but this mushroom sauce beats it hands down. And if you have any leftover, make an omelet with it. Oh My. So good. In stand mixer fitted with paddle attachment, mix 1 cup water with the salt, egg white, pepper, thyme, juniper, garlic and parsley. Mix on medium speed until blended. On medium low speed, mix in 2 cups of the flour, adding more as needed, until dough is firm and feels slightly dry and stiff, like Play Doh. Continue to mix for 2 minutes. The dough should be smooth and firm but not sticky. Add more flour if needed. Flatten dough into a rectangle, wrap in plastic and refrigerate for at least 2 hours and up to 6 hours. An hour before you’re ready to roast, put beef on counter and let sit at room temperature. Position rack in center of oven and heat oven to 350. Heat a large cast iron skillet over medium high heat. Pour in oil and put the roast, meat side down, in skillet; sear until deeply browned, about 5 minutes. Remove roast from pan and set it, bone side down on rack in roasting pan. On lightly floured surface, roll dough into a 1/4 inch thick rectangle. Drape the dough over meat, tucking in on all sides. Roast until an instant read thermometer in middle of roast registers 125 for rare or 135 for medium rare, 1 and 3/4 to 2 and 1/4 hours. Let rest for 20 minutes, then remove and discard crust. 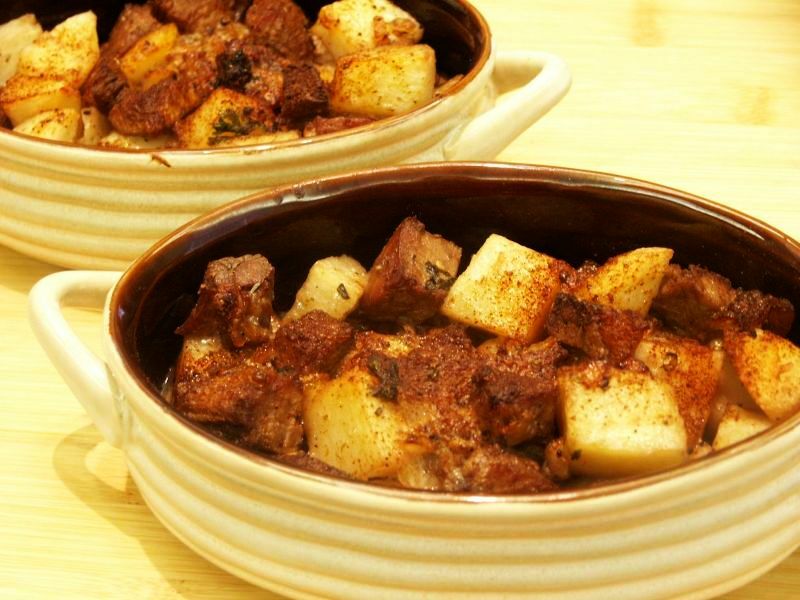 After removing crust, roast can rest for up to another 30 minutes. 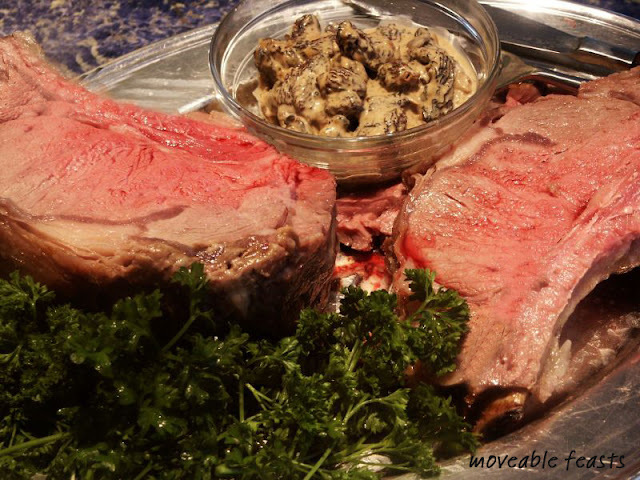 Carve and serve with Morel Sauce. 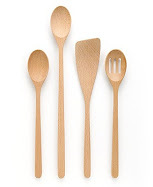 Did you happen to see these on the last page of Martha Stewart's Living December issue? That magazine always has a fun holiday recipe like this...last year I made those white chocolate covered mint cookies. This year, these adorable peppermint cups. Let me be honest here: I'm not the least bit adept with a pastry bag so really wasn't certain I could manage these little melt-in-your-mouth gems. And when I referred back to the photo in the magazine, I noticed theirs were less red than mine. So if you're going to try them, don't paint your red line in the pastry bag as thickly as I did. Unless you like them with as much red as this. All in all, these were wonderful. 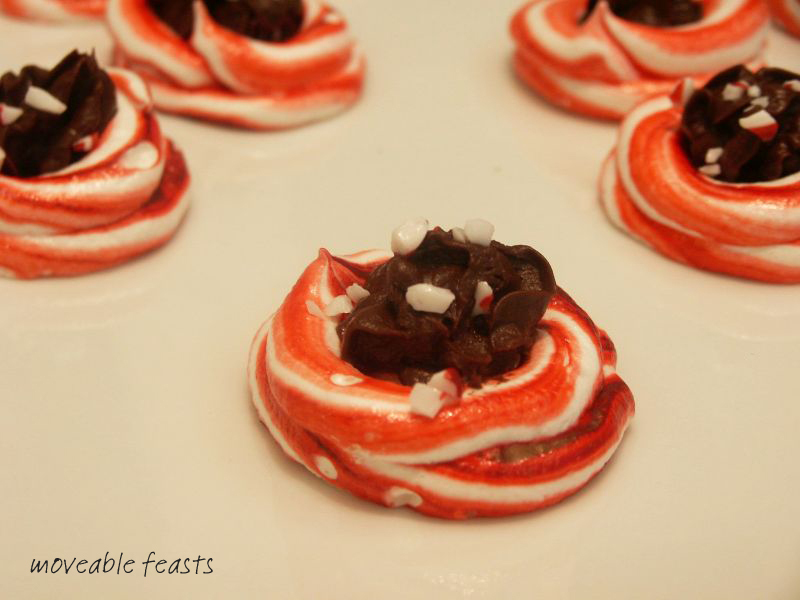 The peppermint taste is just right, the ganache perfect and they are the perfect holiday treat to pop in your mouth. Such fun! Preheat oven to 175° . (Mine registers no lower than 200°, but it worked fine. )Trace 16 circles onto each of 2 pieces of parchment paper, using a 1 and 3/4 inch round cookie cutter, spacing about 2 inches apart. Coat 2 baking pans with the cooking spray and top each with the parchment paper, traced side down. Heat the egg whites and the sugar in a mixer bowl over simmering water until sugar dissolves and the mixture is warm to the touch, about 3 minutes. Transfer bowl to mixer and beat until stiff peaks form. Beat in the peppermint extract. Using a small food-safe paint brush, paint three stripes of the red food coloring on the inside of a pastry bag fitted with a 1/4 inch plain round tip. Transfer the meringue to the pastry bag and pipe coils to fill the traced circle. The pipe in the sides to create a 3/4 to 1 inch cup. Bake until meringue cups are crisp but not browned, about 1 1/2 hours. Transfer to a wire rack and cool. Put the chocolate in a bowl. Heat the cream to a simmer and add to the chocolate. Allow to stand for a couple minutes, then stir to dissolve the chocolate. Mix with a wooden spoon until smooth. Cover with plastic wrap, cut a small slit in the top and refrigerate until firm, about 1 hour to one hour and 15 minutes. (I got side-tracked and left mine too long, but microwaved it until it softened enough to put in the pastry bag. Stir the ganache, fill a pastry bag fitted with a 1/4 inch open star tip. Pipe ganache into the meringue cups. Garnish with the crushed peppermint stick.